If you happen to be lucky enough to visit a white sandy beach with really blue water, it’s a sight to behold. When a storm is coming and the water turn’s a murky green. I am in awe of the sea. It’s only natural to want to capture the essence of what I love. I found the palest of Lemon Quartz which represent’s the color of sand. Smooth, like pebbles. Yes, they are carved, but what the heck. I mixed blues and greens together. 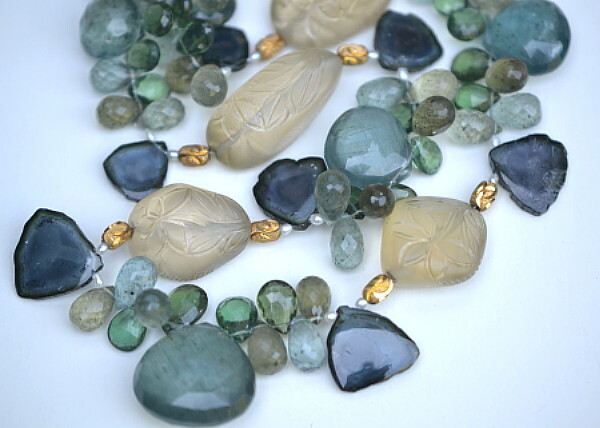 Moss Aquamarine’s in different shades. Deep Blue Tourmaline Slice’s shaped like scallop shell’s. Touches of gold. A day at the beach, around your neck without dripping saltwater. Obviously I don’t take myself too seriously. But I do love this necklace. Someone who loves wearable art will love this too….once my web store is running. Hope you enjoy looking at my necklace called “Mermaids” I can picture this on a mermaid. You.